Greece is one of the most highly-desired locations for Destination Weddings in the world, and from even the briefest Google search, you can understand exactly why! 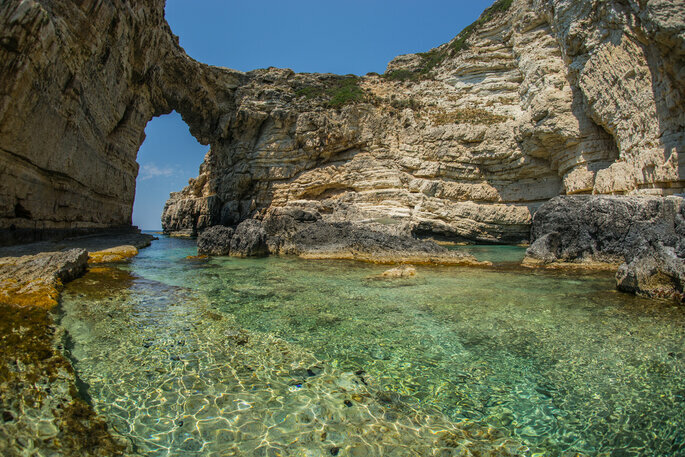 Home to some of the greatest love stories in the world – from Captain Corelli’s Antonio and Pelagia to Mamma Mia’s Donna and Sam – Greece is an idyllic paradise, utterly removed from the hustle and bustle of the rest of the world. 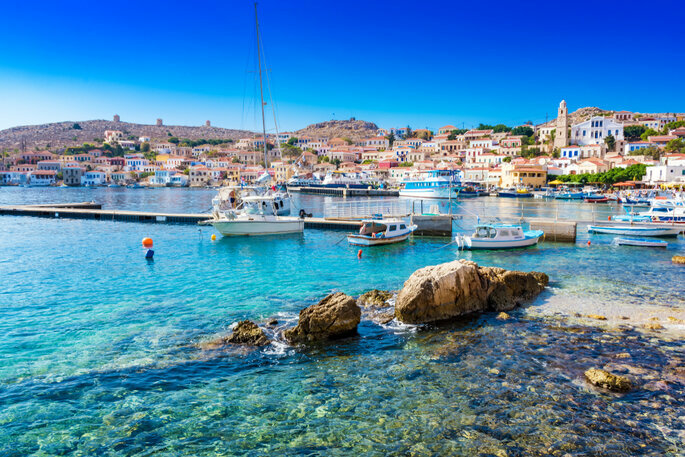 A place to forget about day-to-day life and the stresses of modern life, Greece is a picturesque retreat where you can spend hours lounging on the beach, and enjoying life in one of the most culturally advanced civilisations in the world. 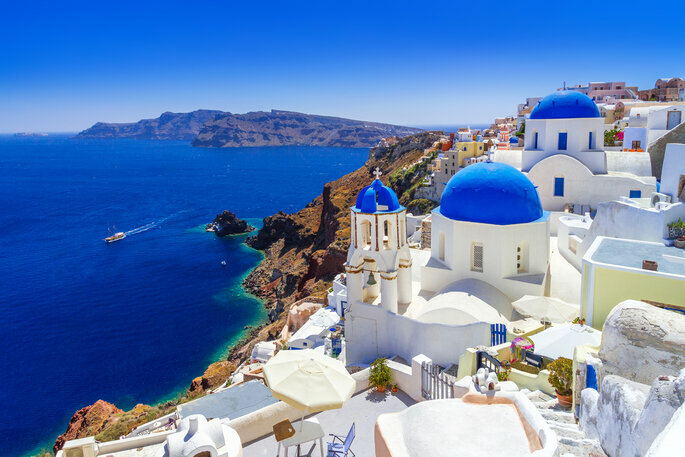 As such, aside from being great for weddings, we at Zankyou would like to go on record and state that Greece is one of the best countries in the world for your honeymoon! Read on to discover more about this incredible country and just why you should book today! First off, we should clarify that visiting Greece for your honeymoon will require a little more legwork than somewhere more compact such as Austria or Portugal. 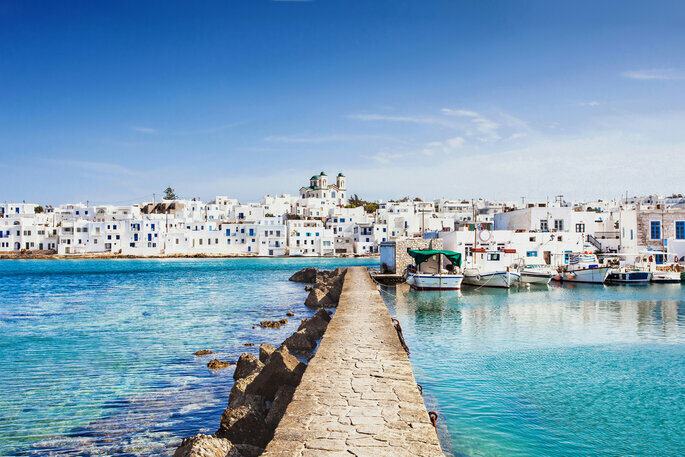 The Greek mainland is absolutely gorgeous, but it also happens to be surrounded by nearly 8,000 islands – which will offer you a much more romantic or intimate honeymoon if that is what you want. These 8,000 islands include such famous destinations as Santorini, Skopelos and Ikaria: essentially, places that are not to be missed! As a result, for your amazing Greek honeymoon, we recommend that you do not settle immediately in one place for the whole time – get ready to move around a bit! Greece is one of the most visited countries in the world, welcoming millions upon millions of foreigners every year. And although it has experienced some economic hardship in recent years, you won’t have to worry about compromising on style and luxury for your honeymoon – there is a wealth of hotels, villas and private homes to be booked that offer the most unbelievable ocean views. The currency conversion from AUD to EUR is strong at the moment so book soon for a great deal! The permanent population of Greece is around 11 million, and the most spoken language is – unsurprisingly! – Greek. Though you will be able to find English speakers with ease in the big cities like Athens and Corfu, the farther you travel from the tourist hotspots, the more you will have to consult your travel dictionary. 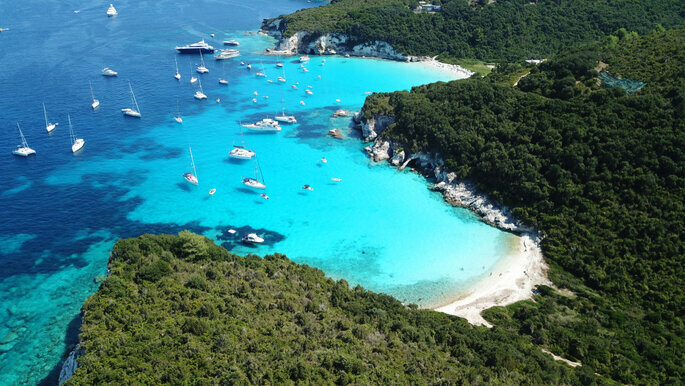 As aforementioned, there is a litany of Greek islands to choose from for your honeymoon. As such, we are going to focus on four main destinations that you can – and should – visit for your first trip away as newlyweds: Athens (the illustrious capital), Mykonos, Paxi and Santorini. Athens is the obvious place to start. 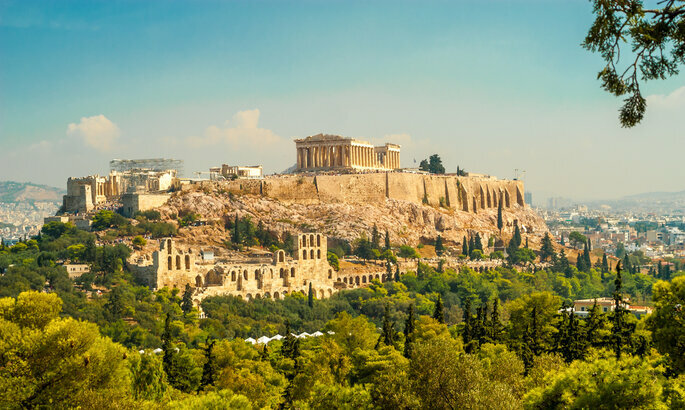 Alongside being one of the most visually stunning cities in the entire world, Athens is the birth place of philosophy and political theory, and way back in the BC years, was the first advanced civilisation in the world in terms of technology and language. To this day remaining a very important cultural hub, this city is home to hundreds of monuments dedicated to the Greek gods – including the breath-taking Acropolis. 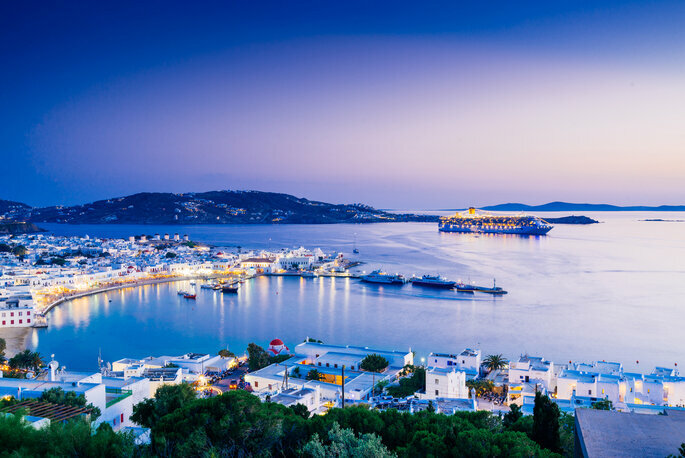 … And the island to do this is definitely Mykonos. Comspolitan, vibrant and totally luxurious, Mykonos is the place to spend a week or so of your honeymoon relaxing, whilst still in the company of your home comforts. You may want to avoid the city if you’re not into the whole tourist vibe, but you can be guaranteed of an extravagant hotel room, an English-speaking waiter, and access to one of the most opulent coastlines in the country. Whilst, there are a couple of places you should try and visit. Delos is an ancient ruin right along the coast that offers a real flavor of the past, whilst a quick trek up the road (and up a hill!) to Cynthus will give you one an enviable – and very Instagram-able – view of the ocean you won’t get in many other places. And alongside the many restaurants and hotels, there are also lots of clubs if you feel like reliving your youth one evening! 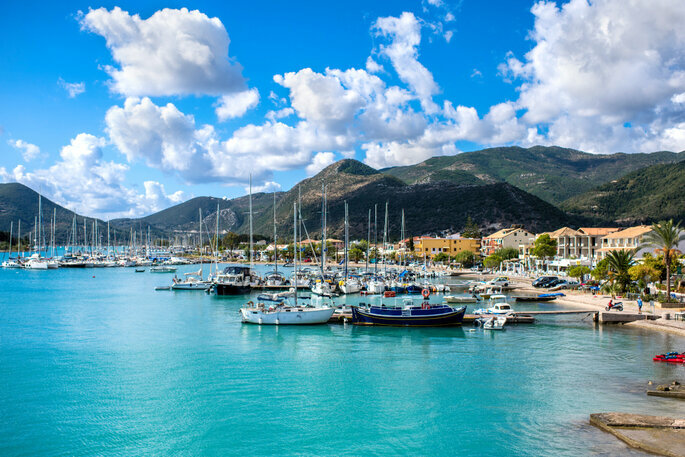 However, if you want to shy away from any kind of exploration and activity on your honeymoon, and would rather soak up the luscious Greek sunshine for two weeks instead, then Paxi is the place for you. Whilst we would recommend visiting all of the places in this article, Paxi is the dream destination for the ultimate relaxing honeymoon. A boat-trip from the nearby island of Corfu, it is a taste of the real Greece. Though you will not find the stereotypical blue tiles and white streets here, you will find private beaches and a distinct lack of other people. Indeed, this is the destination for the most private of couples who are looking forward to spending their honeymoon completely alone from the rest of the world. Here, you can sprawl on the beach, walk along the coast, and make a quick trip out into these aquamarine waters on a boat – and do little else! And what better way to end your trip to Greece than to take a quick tour of one of the most picturesque places on the planet? Famous for its incredible white buildings, and unsettlingly blue seas, you will fall in love all over again in this corner of paradise. One of the more populated areas of Greece, Santorini boasts an outdoor cinema where you watch an old classic one evening, and several vineyards where you can take an exclusive wine tour. Indeed, Santorini is tour-country: explore via boat, helicopter, or go deep-sea diving with a trained instructor. However you choose to, make the most of the nine hour flight and find every hidden treasure that Santorini has. However, if you’re not a fish fan, then there’s no need to panic! 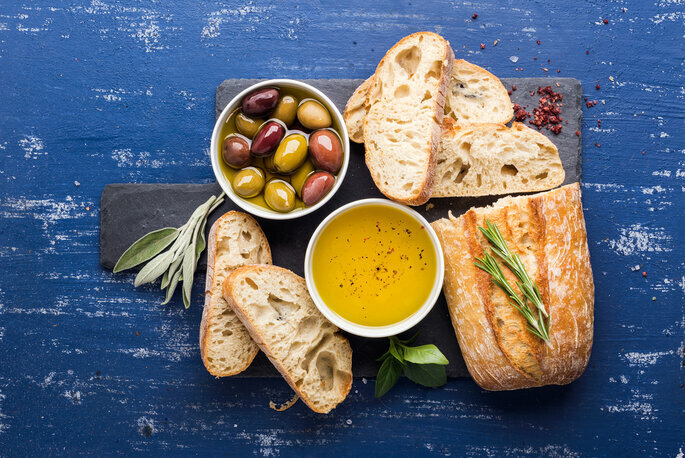 Incorporating most of the staples of the Mediterranean diet into their most common dishes, Greek food is hugely diverse – from dishes rich in olive oil (and often dotted with olives themselves! ), to meat courses (lamb is a favorite) that would rival any 5* restaurant in the US, and traditional Turkish dishes too (thanks to a shared history under the Ottoman Empire). We can’t promise good weather if you travel outside of the summer months, but we can promise you’ll come back at least a few kilos heavier! 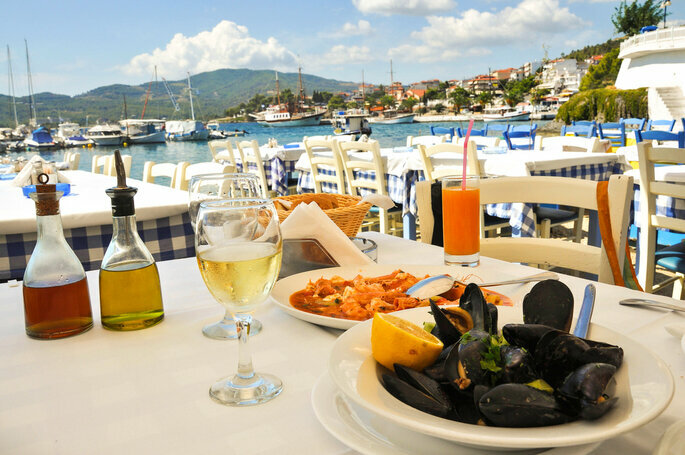 Most European countries are pretty easy to navigate; Greece is the exception. If you stay on the mainland, then the only thing you will have to deal with are delays with your taxi and with public transport – if you’re heading to any one of the islands, you have to do so via boat. The more popular islands like Corfu have more stable infastructure for travelling, but timetables for journeys don’t really exist – it is more of a case that the captains leave when they want! So if you’re considering Greece for your honeymoon, go to a professional and get them to book all of your travel for you. Trust us – it’s vital! Greece is one of the most romantic countries in the world, and we cross our hearts when we tell you that you will have an unforgettable experience here. 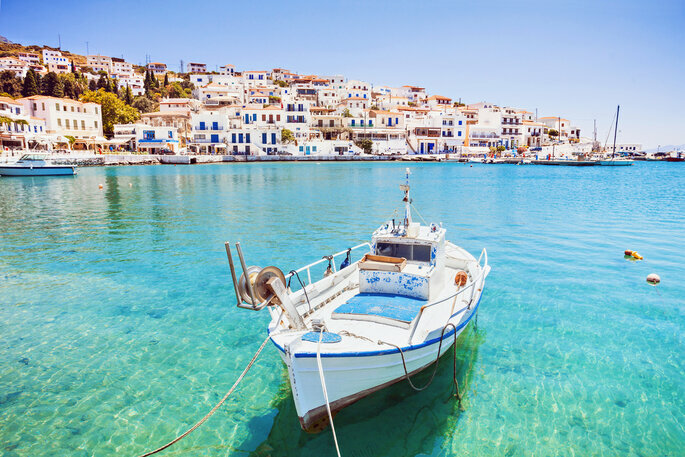 Whether you want to explore the nation that created modern philosophy and the foundations of Western civilisation, or just take a deserved few weeks to chill out on its stunning beaches, Greece will not let you down. There is always something to do – and always a place to go when you don’t want to do anything! Escape from daily life and experience a new culture, new foods, and watch the beautiful sunrise from your villa window. Don’t hesitate – book those flights now! The Southeast Asian country is still one of the most popular places for a honeymoon destination. Why not discover it and all of it's special corners with your loved one. Costa Rica, the land of 'La Pura Vida', is one of the most diverse and beautifully exotic countries in the world. With a vibrant, eccentric and relaxed atmosphere throughout it's tropical terrain, it really is the perfect destination for an adventurous honeymoon.